I am not that much of a planner blog. 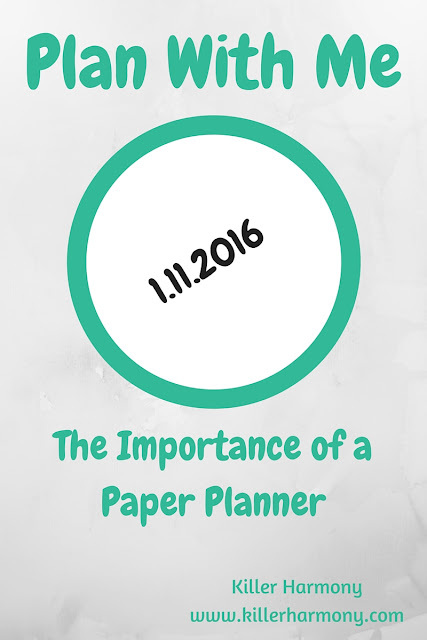 Meaning: I don’t really blog about how I plan, but I do believe that it is important to write things down in a physical planner. Don’t get me wrong, I love the calendar app on my phone, but some things are just better to see written down on paper. Last May, I got my very first Erin Condren Life Planner. 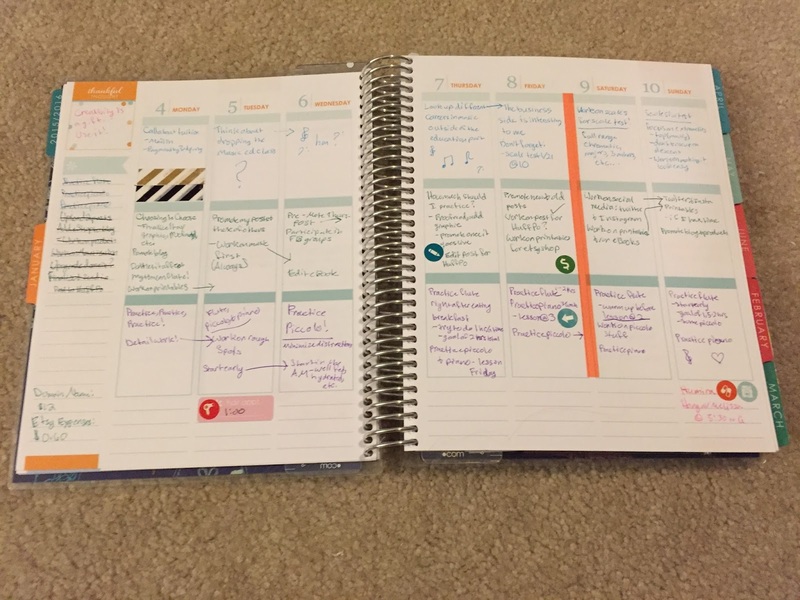 I was a little skeptical of how great this planner system could be, but I really love it. Like, a lot. I used to think, “Oh, I don’t need a paper planner, my phone is just fine.” I still think that electronic calendars work, but there is something about writing down what you need to do. Plus, for me, it has become a hobby. I love using colored pens and washi tape and stickers to decorate my week. You can’t do that with a calendar app, or at least, not with the apps I’ve heard of. *Side Note: Even though I am in college and it might seem like a planner for me should start in August, I prefer going by the calendar year. I usually take summer classes, so I don’t see the value in getting a new planner in August. Also, since I will be done with my degree in a couple of years, it won’t make sense for me to use a planner based on the academic year. Back to the post, I have been loving the vertical layout of these planners, although, now you can get one in a horizontal layout or in a vertical layout with the hours pre-printed. I did put my planner on my Christmas list, and I decided to go with the vertical layout. That design was part of why I tried the planner out in the first place. The other was that I got it when they were on sale. I prefer the vertical layout to the horizontal layout, because it is more representative of how the week looks and how it flows. 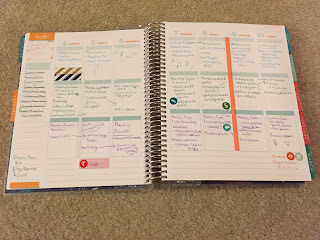 If you have read my post on the 2015 Erin Condren planner, you might have noticed that I didn’t show much of the inside of the planner, but in this post, I want to break down how I plan out my week. This week is not a typical week, because I don’t have classes yet. I have decided to play around with the way I plan out my week, and I will try to post an update on how I like or don’t like my new system. The 2015 planners had Morning, Day, and Night preprinted on the little boxes on each day. In the new planners, you still get three boxes per day, but it is up to each person to decide how they want to use them. I have settled on the categories: Classes, Blog/Work, and Music, with the space below that being for personal things (these things usually come up fairly last minute as I barely have a social life. These may change as I experiment with my planner (I actually switched the Blog/Work and Music sections starting this week). Also, my Saturdays and Sundays will probably have something instead of Classes. I’m deciding between To-Do List and Next Week. My method last year was to write in the times that I had a class, and if anything special was happening or was due, I would add that below the class. I used blue for my music lectures (music history, theory, etc. ), purple was performances/rehearsals, red was my one non-music class, pink was personal, and green was health. Since I will be putting classes into a different section than personal, I will still use a similar system. Blue, purple, and pink will stay the same. Green will become blog/income related things, and red will become health-related topics. Here is a picture of my set up from last week. 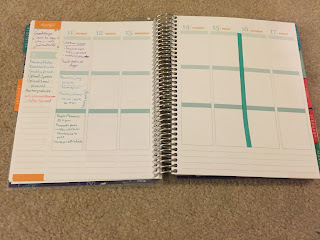 I recently purchased the Erin Condren Do-It-All Dots to use in my planner. I have wanted to incorporate stickers into my planner, and they are a great way to do that. I really like the stickers, because they add something that can’t be done with just using pen. You can see how I utilized some of the stickers in my weekly layout last week. For this week, my last week of winter break (insert sad face), I don’t have much going on, just a few appointments. I might do a plan with me when I am in school so that you can see how I organize my life during the normal semester. Also, in this post, you will see that I only have one day filled out for this week. When I have school, it is a lot easier for me to plan out the week all in advance, but since I don’t have that luxury right now, I just plan day by day. On the left side of the page, there is a place to write a “Thankful Thought” followed by a place to write down goals and to-dos for the week. I like to write a short little quote in there that reminds me to be thankful for everything that I have. I also make sure to fill out the column on the left with my to do list or goals for the week. I try to keep things consistent by using the same color coding system. When I finish something on that list, I cross it off with black ink. On the bottom of that column, I also track my business and blog expenses. This past week, I purchased a domain name for my blog, and I also launched and Etsy shop and listed three items. Those expenses, of course go in green. 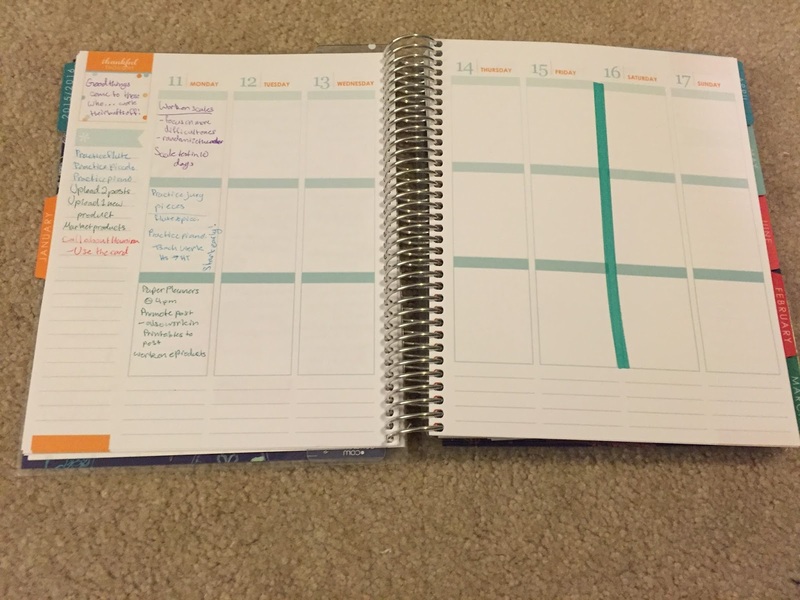 I have not made any money yet, but I know that I will be tracking income in my planner, too. I like to separate the weekend from the week using thin washi tape. I got a pack of 8 for eight dollars (woot woot!). So, that is an overview of how I use my planner, during school breaks at least. I will probably do another plan with me during the semester here in a couple months, so be on the look out for that! I agree! I looooove Erin Condren planners!! I used them all throughout high school and my first two years in college! Aren't they the best? I wish I started using them sooner, but either way, I'm glad I found them! Previous Previous post: How Much Should I Practice Music? Next Next post: Posting Schedule for the Spring + New Etsy Shop!